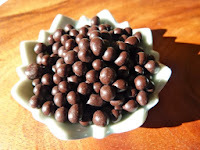 Today was Day #2 of Chocolate and Quinoa Theme Week. The Organic Popped Quinoa at the hear(s) of these glossy, bee-bee sized dark chocolate pearls, from Wonder Food (Palm Desert, CA), were light and slightly crunchy. The 70% dark chocolate coating had a deep, slightly earthy flavor, helping bring down the sweetness level to one that I enjoyed. And, I did appreciate the lack of extra additives and preservatives -- that allowed authentic flavors to shine through. 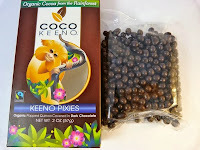 The package was adorned with two adorable golden tamarind monkeys ("Coco" and "Keeno") who serve as the mascots for the company's Coco Keeno product line -- made up of several products. 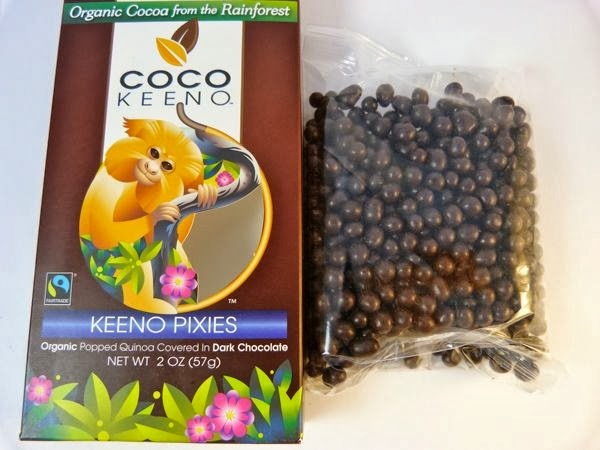 Stay tuned tomorrow for another Coco Keeno quinoa and chocolate offering (with colorful candy shells). Labels: chocolate and quinoa, Wonder Food Co.